Have you bought iridium spark plugs because they give sparks better? or have someone advice you to change to iridium spark plugs since they make your bike faster? or give a bigger spark? or the spark is steady? “How much HP will i get from changing to iridium spark plugs?” The answer is Almost none! Motorcycle manufacturer commonly use Ordinary Copper spark plugs because they are cheaper. But there performance is the same as the iridium spark plugs. There is really no significant change in the motorcycle performance when using iridium spark plugs. The downside in using ordinary copper plugs is that they don’t last that long compared to iridium plugs. 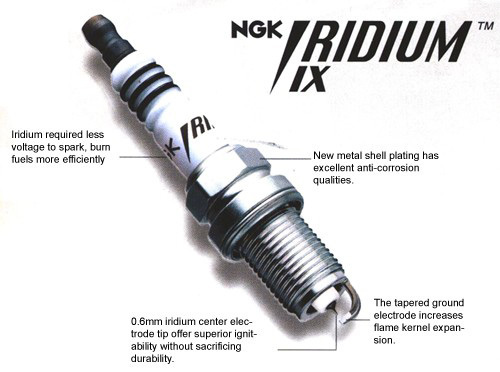 Since iridium is a very dense metal and conducts just as good as copper it is also use in making spark plugs. Because of it’s hardness iridium spark plug last for a very very long time. Since they are harder to get that copper metals they are expensive. So the next time you change your plugs remember that the ordinary plugs are just as good as those special spark plugs. so what advantages can you get from iridium spark plugs? They last a very very very long time making them very reliable.